HomeBlog5S in the Office? Yes, Please! Many LSS companies embrace the principles of 5S in their operations. Increasingly this is true even in non-manufacturing industries such as health care. And many excel at their 5S implementation – in operations. The benefits are obvious to all: Better organization, clearer communications, improved safety, fewer mistakes and better quality. However, all too often the administrative areas and offices of these same firms are left out when it comes to 5S. And that is a shame because the potential for waste in office processes can be as large as – if not larger than – that seen in operations. When considering a typical 5S project, most LSS practitioners immediately envision their operations. They can see the applicability of 5S in a machining cell, a packaging area, an assembly workstation, a teller at a bank, or an operating room at a hospital. Often the need for 5S is obvious. In an office setting the need may be just as obvious with desktops covered with paperwork, stacks of books and magazines to be read, and notes randomly taped to monitors or tacked to walls. At times the most important piece of information is hidden away such as customer requirements taped inside a desk drawer or company standards posted behind a calendar. Some individuals working in an office find themselves making many trips to the copier, printer or supply room – all a form of Waste of Excess Motion. And everyone in an office has experienced the Waste of Waiting – for information, management approval or the printer to get fixed! One key to success is to think more broadly about not only 5S but about LSS in general. Always remember – the basic and most important principle of 5S is to instill discipline in the workplace. This goes against the idea of many LSS practitioners who think 5S is just about getting more organized, or about improving cleanliness. By understanding that 5S is really about discipline this widens its applicability to any process. Remember also that 5S helps to establish a baseline. 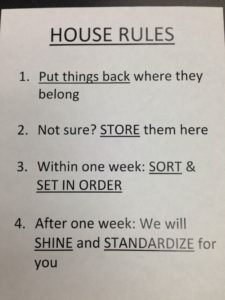 It helps to set expectations which is especially important for new staff. Rather than repeat the 5S methodology (we recommend reviewing your GB or BB materials if you are unsure) we wanted to share some critical considerations in applying this in an office setting. First, it is important to document the current state. Perform a workplace scan by going to the area. Then use photos to capture the ‘before’ state. Some practitioners are now using video. Another tool is a map of the area (see example). It can be used to document the flow of people and information, and to aid in determining a new layout. And just as in a 5S in operations be sure to test out any changes in an office setting. Below are some photos of 5S as applied in a supply room. Note the final photo which provides an overall guide to the program. 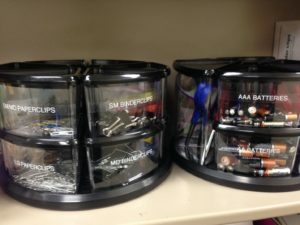 In this supply room example the commonly used items are clearly labeled and made accessible. Workplace organization and a clean and tidy supply room will be achieved. In addition, the need to order supplies is very visible and easily seen. Similar to the operations areas, searching for supplies or stocking out of supplies affects administrative functions equally. After implementing a 5S program, the addition a Kanban system for ensuring supplies are always available without over-ordering becomes that much easier. 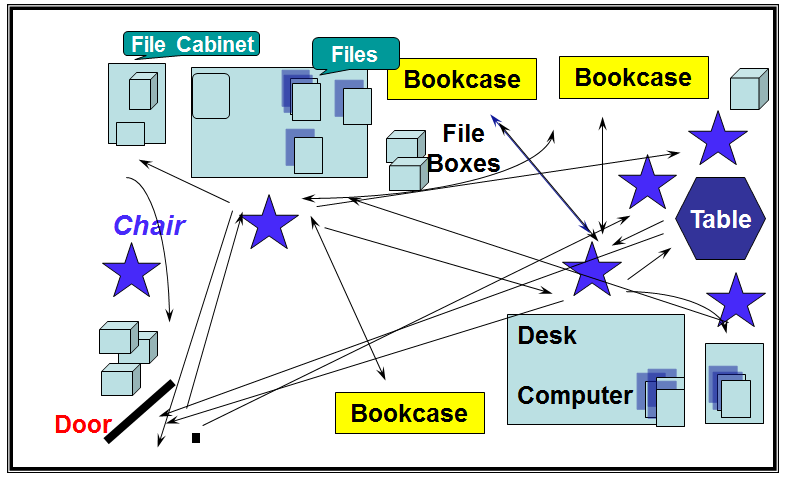 The picture above depicts a situation in which a high moving item is utilizing a Kanban system. 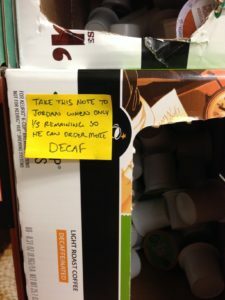 The organization knows that when the coffee is 1/3 full, it needs to order more coffee based on the time it takes to receive that coffee. This simple, four-step approach to maintaining order can be adapted to any workplace. Interested in reading another perspective about 5S in the office? Here is one from TMAC’s Office Manager Katie Beaver… Click here!